Adjacent to CBC’s Broadcasting Centre, in tiny Simcoe Park, sits one of the finer pieces of public art in TORONTO – a city not known for fine pieces of public art. 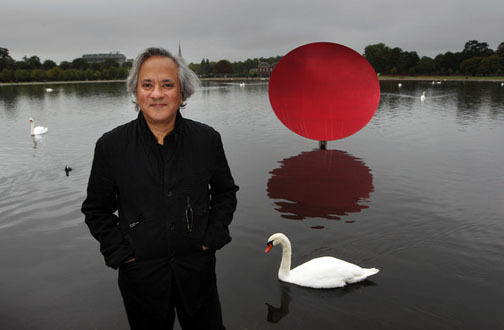 It’s by British sculptor Anish Kapoor. Indian-born, a Royal Academician and a Commander of the British Empire, his work is shown worldwide. In North America, his best-known creation, Cloud Gate, is the centrepiece of Chicago’s Millennium Park, and he’s currently working on a project for London’s Summer Olympics in 2012. The TORONTO sculpture (Untitled, 1995) is made from stacked aluminum layers cut with waterjets. It’s wonderfully photogenic. This entry was posted in Art & Design and tagged Anish Kapoor sculpture, Canada, Toronto. Bookmark the permalink. ← Ryerson University’s ‘secret garden’ . . . in the heart of downtown. The Rockies, come to Toronto.